Timber looks beautiful around the home. However, the reality is that there are many factors working against using timber. Timber can age prematurely and become expensive for the home owner. Exposure to sunlight fades the colour of the wood grain, regular staining becomes costly and time-consuming. Splitting and rotting are inevitable. Argus can provide a durable alternative to timber that can be used on many of our products such as INVISI-GARD security doors. We can also powder coat window grilles, Sure-Safe shutters, fencing, gates and awnings. 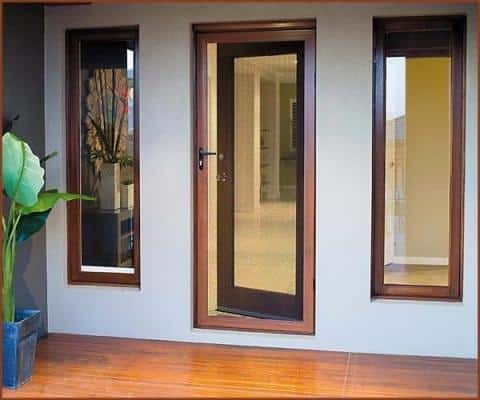 You will enjoy the low maintenance and high durability qualities of aluminium, in addition to the natural beauty and warm textured feel of timber. What are the benefits of woodgrain powder coat? Unlike wood, powder coating durable materials means no splinters, warping, oiling or fading. This will typically outlive wooden applications around the home. Cleaning is a breeze, and requires little elbow grease. Woodgrain powder coating wont rot like wood, and is resistant to termites. Powder coating is more affordable that hardwood for the home owner. Call our office and talk to our staff about your project, and how powder coating can be applied.